Going to the Polls 2016 (#gttp16) was organised by Paul Foxall, one of Birmingham University’s Digital and Technology Skills Advisors and aimed to showcase "how the use of interactive technology can enhance the student’s learning experience in the classroom". 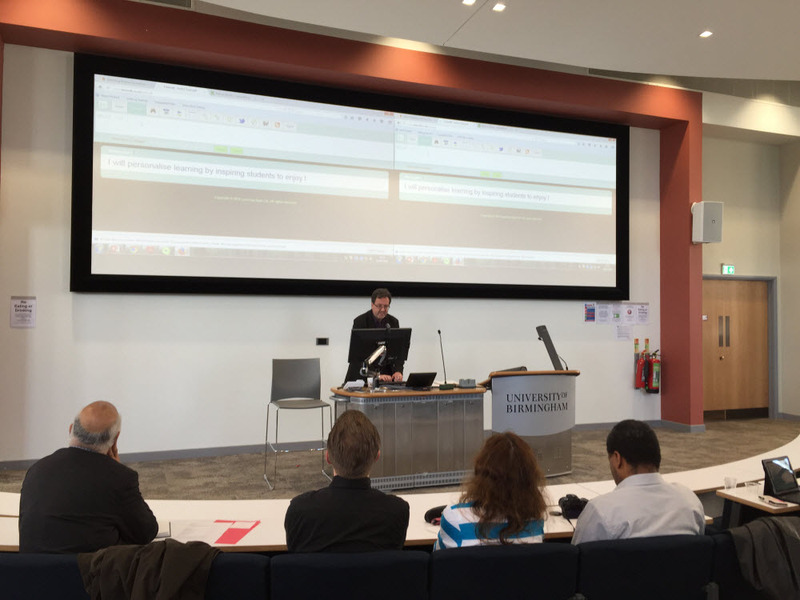 The event was held at the University of Birmingham on April 20th, 2016 and sponsored by TurningPoint, which the University used, as well as ResponseWare. The day kicked off with Turning Technologies Distinguished Educator, Dr. Fabio Aricó (@fabioarico), the Senior Lecturer in Macroeconomics at the University of East Anglia, as the keynote speaker. His talk was about the use of Peer-Instruction to develop self-assessment skills and to generate learning gains in a flipped classroom environment. His extremely thorough research was backed up by quantitative data to prove the learning gains achieved. 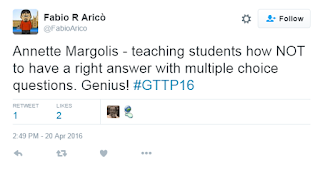 Peer-Instruction (PI) as a teaching method was made popular by Eric Mazur (@eric_mazur) and there are many studies on its use alongside the Flipped Classroom approach in STEM subjects. However, there are fewer studies on its use with social science subjects and Dr Fabio Aricó's work clearly adds value to demonstrate the application of PI in the subject of Macroeconomics. Engage in teaching-led research for personal development (Let your teaching lead the research, not the other way around). 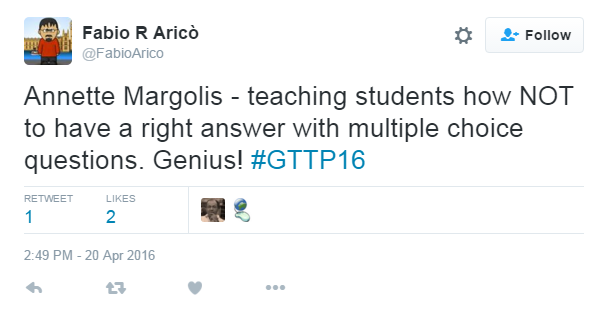 It's not about the technology, it's about the pedagogy and more importantly, it's about the students. Be concerned about ethics but do not be discouraged or scared as the students are not according to JISC. Choose your demonstrators carefully - the average user of technology may be more convincing than an expert. Fabio was also to be praised for his overt attempt to raise his learners' epistemologically awareness. The learners were able to see for themselves through the polling data how much better they understood concepts after discussion with their peers and this gave them buy-in to the method of teaching. Prof. Prem Kumar (University of Birmingham) was up next and presented on the highs and lows of adopting a flipped approach. His humorous but insightful talk was full of encouragement for lecturers to 'try, try and then try again' when it came to implementing the flipped classroom. He labelled the four stages of learning as Clueless, Naïvely Confident, Discouragingly Realistic, and Mastery Achieved, paying homage to the Conscious Competence learning model. In fact, his labels on these four stages are much more sympathetic than the original - no one wants to be labelled 'consciously incompetent'! His struggles with implementing the flipped classroom approach led him to add a stage before Mastery Achieved: Semi-Conscious Competence or Nagging Self-doubt. This is a stage where "you know there's even more about what you don't know, than what you do know." Prem's talk was very much about the challenges he faced and provided the yin to the yang in terms of approaching self-development - rigourous and data-driven like Fabio's approach, or deeply reflective and anecdotal, like Prem's approach. He raised the point that changing practice was no longer an option - improving the student experience and increasing learning gains in a lecture was part of a practitioner's commitment to teaching quality, now driven by the Teaching Excellence Framework (TEF). Prem spent a little time talking about the discomfort of the change in practice in the lecture theatre - having to stand and wait while learners discussed things, or thought about things in silence. Having the presence to 'control' the class while using such disruptive techniques was clearly something that needed to be mastered. David Matthew is a learning technologist from the University of Bedfordshire and he talked about 'Textwall for the shy'. His definition of 'shy' was anyone who was previously unengaged in the classroom or felt unable to contribute in some way. Working in the Health and Social Care department at the university, a key conflict of using Textwall with the students was the modelling of practice. The students were likely to have to turn off their mobiles in a Practice situation. However, this also became a good incentive to aid learning, almost as a reward for participating and contributing in class. Like Fabio, the experience was that after the novelty factor had died off, both staff and students could just focus on the learning and the affordances of the tool could be taken for granted. Other presentations on the use of clickers were of less interest to me, I must admit, although it does form a necessary part of learning about any technology. One presentation that did make me sit up and take notice was Annette Margolis' use of Socrative as an alternative to clickers. Annette works in the Language department (apologiesbif I have got this wrong, but I will follow up and find out!). She engaged us in her Socrative exercise and used it as a way to illustrate how she triggered active learning in the students by making them choose an answer when there was possibly no one right answer. She encouraged us in peer discussion before the results or consensus of the room was revealed and this led to further insights into the way our minds were working. Annette inspired me to go away and create an example for Textwall users (Fig 1) to demonstrate how using voting could result in an activity that was higher-order thinking on Bloom's taxonomy. Designing questions can be a difficult task and questions used to trigger discussions in the lecture are of a different nature to questions used to test knowledge and understanding. When the delegates were polled about whether they thought they needed training on this, the answer was a resounding (and surprising) no. Either the audience was very clued up and pedagogically expert, or they were (in Prem's words) Naïvely Confident. This topic will probably become another blog post at some point. There was an overwhelming consensus that the event had been successful and that we should form some sort of online community to support each other in our progress. I must compliment Paul Foxall and his colleague, Debbie Carter, on their choices of presenters and the range of topics covered, ensuring that all aspects of using student response systems (SRS) were covered as well as could be in a day. I made some valuable contacts, learned much and look forward to participating again in future in the 'polling' community.